I purchase eight of these curtains to put at my sliding doors. The color is just lively, matches my floors. I would definitely recommend anyone purchase these curtains. Good quality and very thick. Will upload pictures as soon the installment is done. Add a touch of sophisticated style to your bedroom decor with the Five Queens Court Vaughn Stripe lined & insulated window panel. Featuring a modern vertical stripe weave pattern on an ultra-soft cotton fabric that is also durable and resilient. The lining is an engineered poly-cotton fabric which helps to save energy and keep your home cool and comfortably insulated. Coordinate with our Five Queens Court Vaughn Jacobean panel for added layering to your windows. These panels are custom cut to create a perfect match when hanging two panels together. 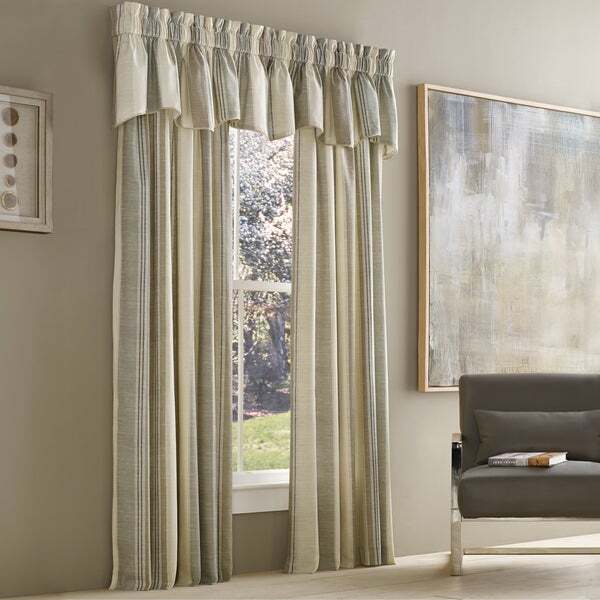 The window panel is made with hassle-free easy hanging rod pocket construction. Available in 3 charming chic color options: French Blue, Natural, and Spice. They are available in 3 different sizes to fit any window in your home: 50x63, 50x84, and 50x95. Window valance is sold separately. Dimensions 95.0 In. X 50.0 In. "What other color is in the blue curtain?"